I have to tell you, The Summer Slaughter Tour was one of the most extreme metal concerts that Matt Martinez and I ever attended. There was so much death metal, and intense spine-busting fandom. I could feel the magnitude of their talented musicianship, just resonate from each band, and how they command respect from the audience. It is an annual mini festival, that tours every summer. The headlining acts involved at this year’s event were, The Black Dahlia Murder and Dying Fetus. 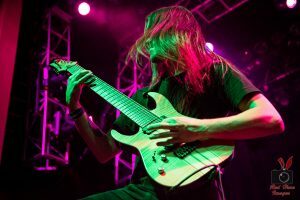 We were guests of the deathcore group, Rings of Saturn. They are one of the most distinctive deathcore bands, who usually sing about aliens and outer space. Critics and fans have dubbed them, an “alien-core” band. After they performed, I had the chance to have a chat with two members of the group, guitarist Miles Dimitri Baker and drummer Aaron Stechauner. 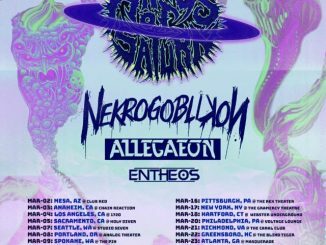 They are the two newest members of Rings of Saturn, who were gracious enough to lay it on the line and let me into their world. When introducing them, I had a little trouble pronouncing Stechauner’s last name, so I call him “Aaron S” in the interview. 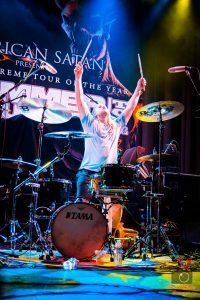 Though they are the newest members, Aaron S mentioned how their leader, Lucas Mann, had a love for aliens, UFOs, video games, and thought, because of the sound the band was creating when first formed, Rings of Saturn sounded really cool. 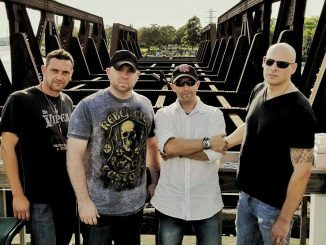 Baker mentions that he enjoys writing the music, but lyrical content goes to Mann, as confirmed by Aaron S. Joining the band in 2014, Aaron S originally tried out, but was not chosen at the time. After they went through a couple of drummers, he was asked to join. 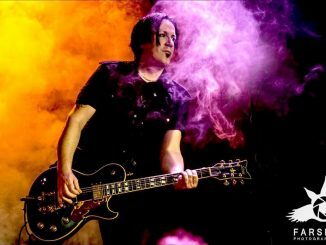 Baker became the new guitarist, through his friendship with Mann, and he loves the band. 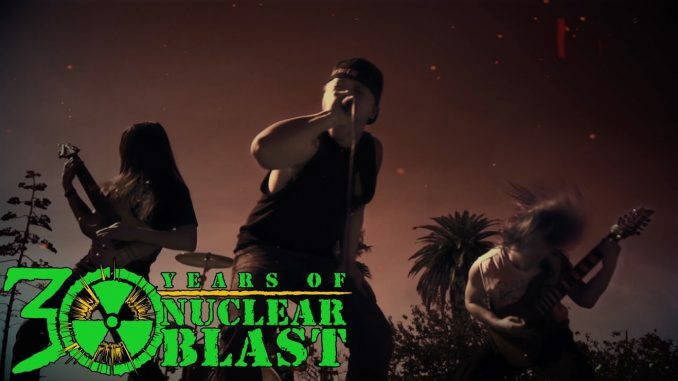 We would talk about Rings of Saturn’s new album,Ultu Ulla, which means “time immemorial.” They recently signed with Nuclear Blast Records, and one of the reasons they joined them, was because of their laid back nature. They were willing to work with the group and create what they wanted. Ultu Ulla is the third album with lead singer, Ian Bearer. When asked if he was the vocalist they wanted to work with, both Aaron S and Baker say he is an awesome frontman, and are proud to work with him. Fan reception of the album is going very well, which makes them very happy. I would go on to ask them about what their tour plans are, and who their musical influences were growing up. When I asked them my Beatles or Rolling Stones question, they both responded “Beatles” without hesitation. 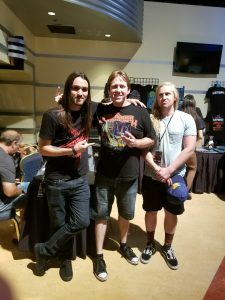 I had a lot of fun talking to these two righteous death metalheads. Both were more than happy to chat with B-Mac, and we all had a blast getting to know each other. During the interview, there were a couple of phone noises coming from my Samsung Galaxy 8, which I’m still fiddling with. So for that, I offer my apologies. If fans want a copy of Ultu Ulla, then go grab yourself a copy, you will enjoy it. To Rings of Saturn, I salute you. Horns up!! !